1,Please keep hair dry and neatly groomed before using. 2,Insert the plug into proper the socket. 3,Turn it on and adjust the temperature, you can use when the temperature reach what you want. 4,In the process of using, one hand pulls hair end and comb with straighter. 5,If you want to keeps straight hair last longer, please use hair styling lotion and softener lotion and wash clean before hair straightening. 6,It should not clip too much hair, if you want to clip more hair, you should be slow down the speed in the process of drawing. 7,It will be turned off by an hour automatically, turn it on when you use against. 1,Make sure the machine is turned off after using, pull out plug and cool down. 2,Stick on detergent cleaning up with a cloth, and pack up when it's dry . 1,Keep it dry and don't use it in bathroom and wet area. Please don't knock it or fall off from high attitude, please don't use if there is any damage. 2,Please don't rework, dismantle and repair this product. 3,Please don't put this product into the fire or external heating. 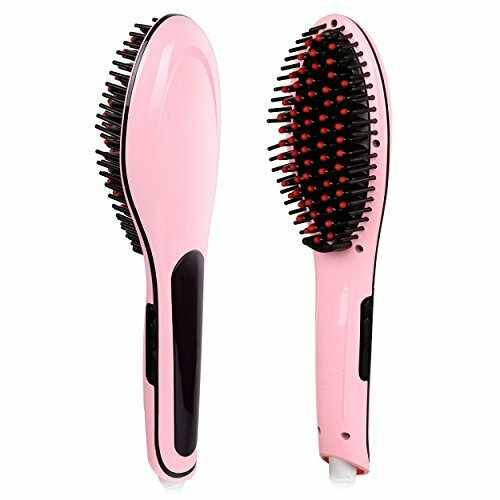 Note: The straightener brush is US plug, you can use it freely in USA. The item is shipped from China, will arrive in 7-15 days after shipment.